Washington C.H., Sept. 18. Standing like a sturdy sentinel jealously guarding the picturesque Paint Creek Valley, three miles south of Bainbridge, the garden spot of Southern Ohio, old Copperas Mountain towers above the surrounding hills of Ross County, making them sink into insignificance beside its stately peaks…. But Copperas, like Mt. Pelee, bids fair to prove a treacherous friend. Its stolid, calm exterior, which has stood for centuries, keeping watch and guard over the fertile valley and its busy inhabitants, is now disturbed by internal dissension and the muttering of the approaching storm is heard. Copperas Mountain is on fire. From the crevices in the slate, which from time to time scales off and falls with a crash into the creek below, may now be seen tiny columns of smoke arising, and closer investigation discloses the outcropping slate red hot. Where the heat is more intense the black slate has turned to a dull brown, and sulphurous fumes arise. These volcanic symptoms have been noticed before by residents near the mountain, but not until the recent disaster in Martinique has any fear been felt or expressed. About 20 years ago, according to the stories of the old citizens, Copperas Mountain sent forth smoke and perhaps some flame, which at the time caused a little excitement, but as it died away the people were lulled to peace again, and the incident was gradually forgotten. Several months ago smoke was again noticed on the mountain side, and when some fearless mountaineers laboriously climbed to the spot it was so hot they could stand for a few moments only on the burning slate. About the time of the Pelee eruption some of the natives claim there was an increased activity on Copperas, and on dark nights small flames belched forth, and the smell of sulphur could be distinctly detected in the vicinity. A great many people have become alarmed at these indications and think there may be some connection with Mt. Pelee, and that perhaps Paint Valley is in danger of a disaster similar to that of the Island of Martinique only on a smaller scale. Others scoff at this and say it is only the outcropping of sulphur and copperas which has become fired by the heat of the sun and that there is no need to fear an eruption. The sides of the mountain where the smoke has recently been seen is so precipitous that it is almost impossible to make a close investigation unless someone is lowered by means of a rope from the top of the mountain. As the heat is so great, no one has yet been willing to undertake this method of investigation, but it is now possible some action will be taken by scientists to get the actual facts and discover if there are any volcanic symptoms. Copperas is iron sulfate, also known as iron vitriol. It has a greenish color and was used in inks and dyes, as well as other industrial applications. As the next article reveals, Science, in the person of geologist Willard Hayes, rather deflatingly solved the mystery. SAYS THERE IS NO DANGER AT COPPERAS MOUNTAIN. There is no danger of Copperas Mountain, located in Paint Creek Valley, near Bainbridge, Ross County, O., becoming an understudy of Mt. Pelee, according to the geologists of the United States Geological Survey. The story sent over from Bainbridge yesterday to the effect that the people living in the valley were becoming alarmed over the appearance of the smoke and sulphurous gases at Copperas Mountain was read with interest by the Government geologists. The interest was tinctured heavily with amusement, for it is asserted there is not the slightest possible danger of an eruption. Bainbridge is on the edge of the coal region in Southern Ohio and Copperas Mountain is merely a hill. Very likely coal beds underlie it and their presence, in the opinion of the geologists, explains the smoke and gases. “If the story is true that smoke and sulphurous gases are issuing from Copperas Mountain it is not difficult to account for them. There doubtless are coal deposits under the mountains and they probably have caught fire. Iron pyrite is usually associated with coal and oxidizes when it comes in contact with the air, forming iron sulphate of copperas. It is usually found impregnated with water from coal mines. Iron pyrites in sufficient quantities may catch fire by spontaneous combustion and ignite the coal. When it burns it forms ‘sulphurous’ fumes, and I infer from the story that it is this kind of fumes which the people in Paint Creek Valley have seen. Dr. C. Willard Hayes was a distinguished geologist with the United States Geological Survey. Judging from the many times he is mentioned in the newspapers, he seems to have been our go-to scientist, sent all over the world to inspect smoking fumaroles, predict earthquakes, and reassure the public. 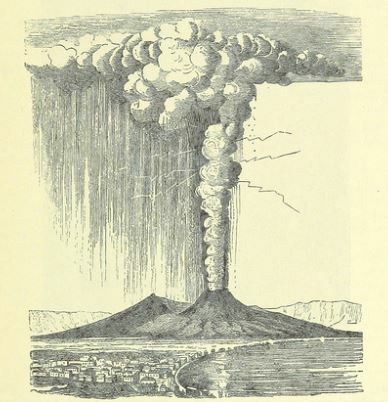 The 1902 explosion of Mount Pelee, a volcano in the Caribbean, was considered the deadliest volcanic disaster of the 20th century. The eruption and pyroclastic flows killed about 30,000 people and destroyed the town of St. Pierre, Martinique on May 8th. This was extensively covered in the papers and would have been on the minds of the local people, especially as it was reported that fissures emitting sulphurous vapors were seen just days before the Mount Pelee eruption. The Copperas Mountain fire was reported to have burnt out by 1921. Coal fires can burn for centuries. See for example, this page below about the New Straitsville Mine Fire in Perry County: http://www.ohiohistoryhost.org/ohiomemory/archives/216. The latest accounts from the disturbed mountain state that so far there has been no volcanic eruptions of lava or fire, though the terrific noise and internal rumblings, heard at a distance, were so great yesterday morning as to induce the belief that a veritable and genuine volcanic outbreak had taken place. Meteors vomited out of a Tennessee volcano–now that would have been worth dodging lava bombs to see. The Copperas Mountain stories are an excerpt from The Headless Horror: Strange and Ghostly Ohio Tales. The book is also available in a Kindle edition.